La Borne, circa 1970. 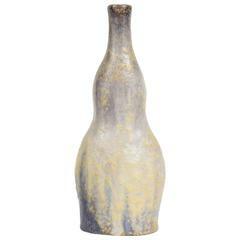 Elegant grey ceramic bottle vase. freeform from the 1970s. Excellent condition. Dimension: 26 x 10 x 10cm. La Borne, circa 1940. Abstract stoneware ceramic plate. Realised for French decorator, signed under the base. Original conditions. Dimensions: 9 x 23 x 12cm. A stoneware vase sculpture by Pierre Digan. Perfect original conditions. Artist monogram under the base, 1970. 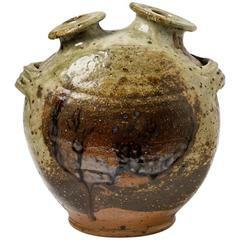 A stoneware covered-pot by Jean Lerat to La Borne. Perfect original conditions. Unique piece. Handwritten signature under the piece " J. Lerat ", circa 1970. An abstract stoneware sculpture, circa 1970 by La Borne Potters. Signed. Unique piece. Beautiful work by East Coast, Maine potter Laurie V Adams Signed and stamped by the artist. Dimensions: 5.5" high, 5.5" diameter. A stoneware vase by Jeanne & Norbert Pierlot to Ratilly. Perfect original conditions. Handwritten signature under the base "Pierlot." circa 1970. Unique piece. A ceramic vase with glaze decoration by Michel Lanos. Perfect original conditions. Signed and dated under the base L, 94, circa 1994. 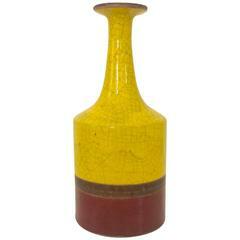 Guido Gambone glazed ceramic, circa 1950, Italy. Luminous yellow, brown and dark red. Signed underside. Measures: 19 cm height, 8 cm diameter. Good original condition. A rare stoneware vase by Jeanne & Norbert Pierlot, to Ratilly. Perfect original conditions. Artist monogram at the base. Unique piece, circa 1970.